Shim kits are available for Air Edgers, Air Knives, Air Amplifiers, and Air Wipes. They maintain the gaps in air knives, flat jet nozzles, air amplifiers, and air wipes. Some companies use plastic shims which wear out quickly, especially if there is any moisture and dirt in the air lines, causing irregular flow and downtime in replacement. 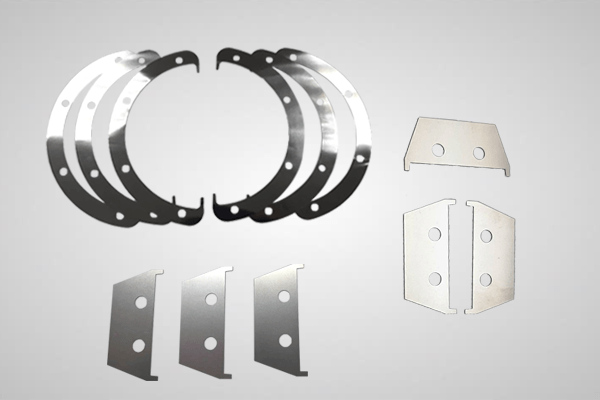 Stainless steel shims are much more rugged and long lasting compared to the plastic ones. The standard size shims utilized in air knives, air wipes, and air amplifiers are .002” (.05 mm) and .004” (0.10 mm) in the flat jet nozzles. Adding thicker shims or additional ones by stacking them, you can increase the flow and force from the blow off products when required, offering great flexibility in manufacturing applications. Because the shims are very thick and sharp, care should be taken to avoid injury from accidental cuts when installing or exchanging/removing them. Special shims can be designed in blow off applications where parts of the blow off product can be blocked off. For example, a special shim was once made for a specially designed Ring Blade™ air wipe allowing air out in only a minimal amount of spots providing blow off over sensors spaced around a cylinder. In some cases where stainless steel is not preferable, shims can be provided in other materials as well.